As the 2001 Uganda presidential elections loomed and the drama that came with it ensued, I hit voting age with no fanfare, rather, steadfast preparation for a matter of greater personal urgency – final examinations. It wasn’t up for discussion that I wouldn’t participate in the election fracas. Attempts at that debate came up again in 2006, and were avoided altogether by 2011. Being a woman, the right to vote isn’t something I take for granted in a world that is still as sexist today as it was centuries ago. But it always seemed piteous to stand in line for an ink-stained thumb and claims that one had exercised a constitutional right in a shady political environment. Thus, although I have a high level of interest in Kizza Besigye, particularly the motivations for his campaign(s) against the presidency of Yoweri Museveni, it hasn’t materialized into actually voting for any of these men, or their opponents – seeing that members of the establishment and many of the so-called opposition seem to be cut from the same cloth; looking out for their personal share of “the national cake” to the continued exclusion of the bulk of the citizens of this country. Yet, choosing not to vote out of despair without committing any effort towards the solution, is not only unhelpful, it is in fact the head-in-sand attitude that has in some ways contributed to our present situation. And so it was with curious detachment that I began reading the recently-released Kizza Besigye and Uganda’s Unfinished Revolution. Like many, part of what drew me to it stems from being a keen follower of the work of the writer, Daniel Kalinaki, one of a handful of insightful Ugandan journalists and a former Managing Editor of the nation’s leading independent daily newspaper, Daily Monitor. 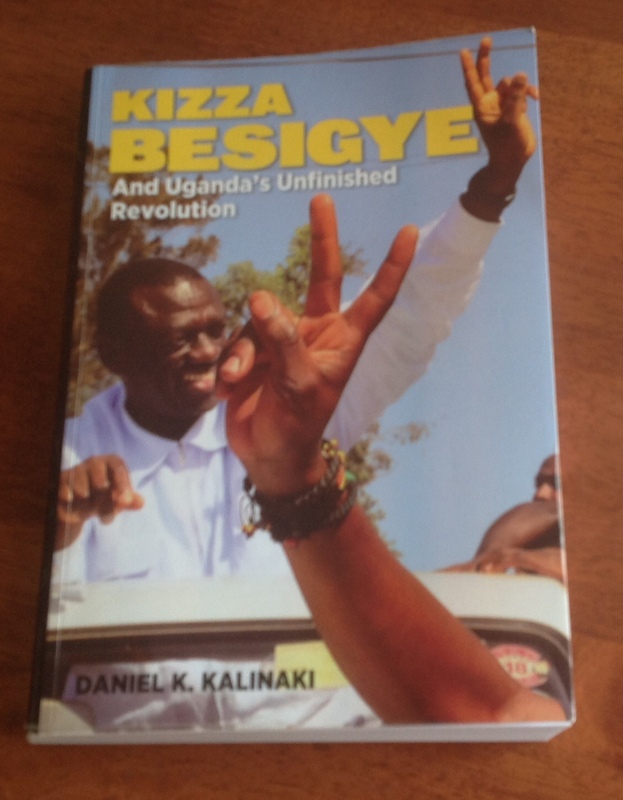 Most importantly, the book promised first-person accounts from Besigye and his wife, Winnie Byanyima. The latter, an astute politician in her own right and currently head of Oxfam, is a remarkable daughter of our country and continent. Daniel delivers exceptionally in this detailed, fast-paced account which in parts reads like the screenplay of a Hollywood blockbuster about an(other) African despot. The book presents a relatively concise history of Uganda politics for the un-immersed, interspersed with the story of Besigye’s journey from his childhood in Rukungiri in western Uganda, his years in medical school at Makerere University, and his subsequent recruitment into the National Resistance Army (NRA) rebel group which later morphed into present-day Uganda People’s Defence Force (UPDF). From then on, we dig into his transition from bush-war comrade to the man at the centre of one of the most intense and long-drawn challenges to power on the continent. It is a who-is-who of the people who spent the first half of the ’80s decade fighting against the government of two-time President Dr. Apolo Milton Obote. The hook is that while it isn’t excessively a treasure trove of hitherto unknown information much as it provides eye-opening spots of insider tidbits (mostly on NRA/M and suspiciously very little on FDC – Besigye’s party), a lot of the juice in it is the commentary shared on otherwise public news events from the perspective of some of the key players in this political opera. Some questions are answered, albeit subject to Besigye’s corner of the ring; some rumours quelled, dots connected, and memories kindled. At various points I was left mouth agape, others very disturbed. Mostly both. One needn’t be a professional politician to know that taking on President Museveni and the system in which we find ourselves is not for the faint-hearted. Too many have a personal stake in maintaining the status quo. And for those who have lived through war and are drained from the daily bombardment of even more gruesome versions of it on television, the fragile peace that we have enjoyed since 1986 is too intoxicating to consider tampering with. But what is peace in a country where our sisters and brothers in northern Uganda spent a decade facing the brunt of a madman and his crew of bloodthirsty rapists, mutilators and murderers? What is freedom in a militarized democracy where the voice of the people is stifled in the name of maintaining public order? Where youth unemployment is raging, while corruption, theft/misuse of public money is rampant but mildly penalized, if at all? Where communities are brought to a standstill by the infestation of jiggers, maternal and infant mortality rates remain high, and essential services like healthcare are a luxury preserved for a few? Where is justice (and common-sense) when the supreme court can rule that an election wasn’t free and fair, and yet claim it to be a legal election? Yet that is the Uganda we live in, even as we are admonished to be grateful – things were, and could be, much worse. Granted, there are some positives, but apparently we ought to be giddy over an economy in which the gap between the haves and the have nots continues to widen as disparities, particularly in relation to one’s proximity to the powerbase on the basis of tribe, and to a lesser extent religion, keep alive the divide-and-rule antics of colonial thugs that were adopted by the ensuing regimes. The timing of this book adds to its wow factor; the year ended with the major fall-out of Museveni’s right-hand man, the former Prime Minister, Amama Mbabazi, who many believe is after the top post. We begin ’15 with the drama surrounding the return from exile of Gen. David Sejusa (formerly Tinyefuza), a war veteran who fled the country in 2013 following the leak of a letter he authored in which it was alleged that there was a plot against NRM historicals who didn’t support plans for the future presidency of Museveni’s son, Muhoozi Kainerugaba. Incidentally, this wasn’t the first time he was clashing with the powers that be. Some details of this friction go as far back as those guerrilla years in the bushes of Luweero, as explained in the book. Just this past weekend, he was under siege at his home in a Kampala suburb. Like or loathe Tinye, it was disconcerting reading about the man’s woes during the liberation war while following his ongoing clash against state forces. Which sadly is the story of Uganda; history, however bloody, keeps repeating itself. For all the fifty years plus of independence, the country has only seen a peaceful transition of power once, from the colonial government. We are our own enemies, with our greed, selfishness, and cognitive dissonance. Take for example the fact that it took our Judas Iscariot MPs a bribe of five million Uganda shillings (approx. equivalent to U.S $3000 at that time, slightly over half of that today) for them to sell-out the future of this country and vote to remove term limits from the constitution. Yet many of the loud-mouths who played a key role in that campaign are the same ones now claiming to be critical of the government and NRM; banking on national amnesia to score access to power that seems ever more elusive thanks to the blank cheque that they gifted the incumbent. This is why people like Besigye, who played a role in birthing the ticking mess in which we find ourselves, present a dilemma for the skeptic. Obviously it would be naive to think that this is the whole story, or even an entirely factual version of what happened. But at the very least we now get to fashion some idea of why Besigye took the road less travelled and what keeps him fired up to continue the struggle in this yet unfinished revolution. In the meantime, some of those mentioned within its pages have already come out to refute the Rtd. Colonel’s recollections. Regardless, we are fast-approaching the 2016 elections, at which point President Museveni will have ruled for 30 years. Those of us who are politically lukewarm are indebted to the millions of Ugandans who turn up to vote in every election, journalists (such as the author of the book) who have paid heftily for writing the truth and watched as their employers are shut down for it, and the many who walked-to-work and continue in various modes of protest as tear gas, beatings, the jailer’s wrath, and bullets rain(ed) on them. Some have lost their lives in the process. It is thanks to them that we are drawn to questioning the system. And that is why this book is important. Kizza Besigye And Uganda’s Unfinished Revolution fits the bill of ‘required reading’ for all Ugandans, especially the youth, and particularly those approaching voting age. This entry was posted in Book review and tagged Books, Kizza Besigye, Politics, Yoweri Museveni on January 7, 2015 by unculturedsisterhood. Very very true…. ‘But what is peace in a country where our sisters and brothers in northern Uganda spent a decade facing the brunt of a madman and his crew of bloodthirsty rapists, mutilators and murderers?